When the iPad was released in April of 2010, intriguing book-based apps began appearing with movable elements. As Elizabeth O. Dulemba’s recent post proved, the discussion about interactivity has just begun. Several e is for book members have story apps that have already been released (click on the Our Ebooks tab under the blog header to see several of them.) The coding for those story apps was done by various iPhone/iPad developers. What I need is a framework to arrange my images, stories, and other media within, and that allows me to add the interactivity that would be appropriate for each book app. We all use word processors now, plus many artists draw and paint with Photoshop, Painter, et al, so why not? So it was with some excitement last week that members of e is for book discovered three companies working on software for creating interactive book apps. All three of them are currently or soon will be doing beta testing...sign up and you may get chance to try the software before anyone else. 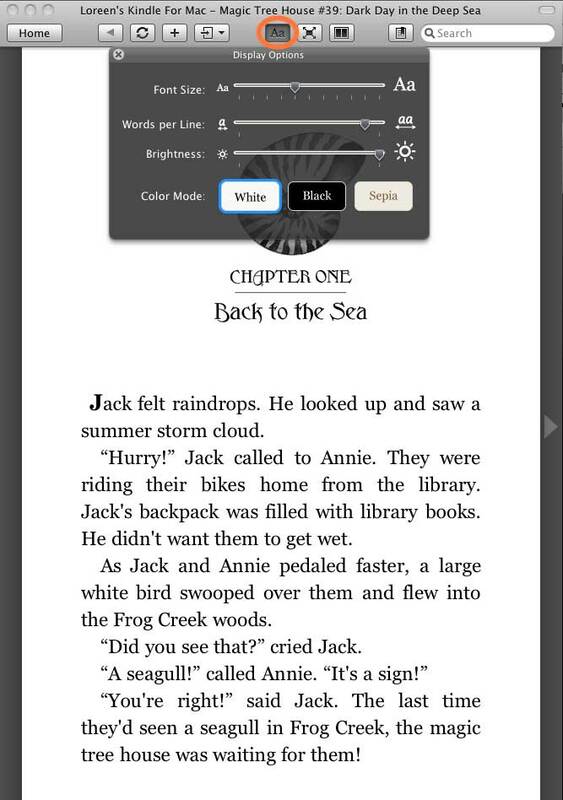 The Composer sofware by Demibooks promises a drag and drop interface that allows you to work directly on the iPad itself. Two cute little girls appear in a video to demonstrate a story app made with the software. There also are several blog posts about the making of Astrojammies. First of all, one of the primary things publishers do is to select what to publish; I doubt that is what is being suggested. Secondly, revenue sharing may mean that the software company will upload the app under their name and give the author/illustrator a share (after deducting Apple’s fee in the case of their App Store). Quite a lot of issues there, such as will there be a right to audit? I wonder if they’ve looked at a typical multi-page book publishing contract lately? If so, they would probably opt for simpler model because it’s very complicated otherwise. In short, I want a relationship similar to the one I have with Adobe: I pay them up front for their software, and they have zero claim upon my creations. That’s the app-creation business model that I’m looking for... it’s only a matter of time. I cannot honestly do the speakers from today justice at the moment. My head is spinning from all of the information. Click to read the rest of Barney’s post. He has at least 2 additional posts up, well worth reading. I left the conference yesterday as it ended, with so much information swirling around my brain. Being from Los Angeles, I was really happy to see snow beginning to fall outside. Even though it isn't something we have in LA, I know snow and it was comforting to see something familiar floating down around me as I headed towards the subway. This was a sharp contrast to the last two days of hearing about things I am so unfamiliar about, dropping down, all around me, with much more speed than the snow. Someone wrote there are three types of people facing the digital publishing wave. There are those who want to pretend it's not happening. There are those who want to retire before it takes over. Then, there is the group who is embracing the change. When I heard that, I knew I had to embrace the change. Maybe if I were living in my fantasy farm house with my converted barn studio and wealthy enough to never need to work, I might just play more music and forget about picture books. But, I work in my converted garage studio in Los Angeles and I frankly don't see ever being able to retire. Don't get me wrong, I have lived and breathed picture books since 1980. I will always LOVE picture books. It's been that way since I first read William Steig's The Amazing Bone. I wanted to live in the forrest with Pearl, the pig. Picture books are magical. I know I'm preaching to the choir, but I want to make it clear, I love picture books and have loved every day I have been lucky enough to wake up and create them. When I first came to NY to sell my first book, I knew the players. It was easy to find them. You looked at your favorite picture book, and there was the name of the publisher. Harper and Row, the holy grail. I sold my first picture book there. Even met Shel Silverstein because I mistakingly took his notes for A Light in the Attic. He met me at the elevator at Harper in Row, waiting for me to hand him back his book. (Oh, if I only had stopped along the way to make a few xerox copies!!!) Green Willow books, Harcourt and Brace, Little Brown, Antheneum, Scribners. (Now a makeup store) Okay, I'm feeling very old all of a sudden!!!! The point is, now, there are so many new players on the block hoping to be the publisher of picture books. These people, for the most part, haven't been editors who have worked their way up by graduating as English Lit majors and finding low paying jobs as assistants and then if they were lucky, to move into becoming an editor. These are people from the tech world. Yes, you have to be a story teller to make games, but it's a different type of story. Maybe that's okay. Maybe that's part of the shift. Stories will change in this new age. They already have. A Hole to Dig, Harold and the Purple Crayon, The Missing Piece. There are books that most likely wouldn't get published these days, as traditional picture books. Marketing departments would kill them. How can we sell a book about a boy and a crayon? We'll have to get Crayola to sponsor it. Maybe Dreamworks will do a movie. Then there would be interest with a movie or TV deal in place. Probably should see if we can make a digital crayon which starts off purple but can morph into a rainbow of colors while you draw! It will be a good followup to Charlottes WebSite that we are going viral with. We'll need the website because kids don't like spiders and maybe we can get them comfortable first on our website after they play a few games. If Charlottes WebSite gets a lot of hits, we can greenlight the book. Nobody knows where this will go, (until the holographic tablets arrive), but it's clear, this is not our fathers Oldsmobile, or whatever that car commercial was for. If I sound like Clint Eastwood mumbling about the future, I want to make it clear, I bought a Mac in 1984. In addition to being an author, I am a children's song writer and I record my music with Pro-tools or Garage band, right on my Mac. I have embraced the tools. The end products have remained the same. Even though music changed from analog to digital, you could still play it in your room on a stereo or in the car. Yes, the players got smaller. We went from a stereo to something size of a stick of gum, but it still played music. If you closed your eyes, you wouldn't know the difference, unless you were an adio file. I have been creating books in photoshop and illustrator, along with continuing to paint and draw. The end result was a picture book. Same as it ever was. (to quote David Byrne) But, this is not my beautiful book. This is a new device to 'deliver' a book and it's questionable wether it's a 'better' book. But, it's here! For those of us who have been blacksmiths, shoeing horses..... Look both ways before you step into the street because there are cars now. There won't be horse drawn carriages unless you are riding around Central Park. So, forgive me if my tone might sound cynical. In spite of all my questions, I am in the group embracing this new technology. I want picture books to survive and thrive in this new delivery method. A story is a story is a story. It might dance when you touch it on the screen, but it will not be looked at more than a few times if the story is missing. There are only so many times you can hurl a bird at a pig. Okay, bad analogy. Apparently one can never do that too many times. But that's a game. We are picture book people! So, lets give them the best picture books we can create, regardless of how they are read! I've got to go back and finish writing my next book! Last talk of my day. Survey of agents re: royalties. 130 responses from 400 they contacted. 7 CEO’s from publishers. There was some inevitable bias. Conversations were candid. Some of the agents comments differed from the CEO’s. 50% is a fair royalty from agents, 20% from publishers. The publishers have legacy operations they have to take care of. Publishers look at from in two buckets. Per unit royalty per units sold. Charging the overheard attributable to the print side to the digital side. Publishers are trying to walk agents through to understand what the costs are. Agents are saying, show me the math. The overall impact for ebacks is favorable for authors for backlists. Publishers are saying they need a year or two to see how this works out. Are the digital going to impact hard copy sales or vice versa? Nobody knows. 25% royalties with the majors. Random House was offering 50% but not the norm. Some publishers have followed that. Some back list books with ambiguous rights have garnered higher royalties. Might not still be happening. Publishers say that’s only the backlist. Smaller publishers are paying lower royalties. Although, some can be brow-beaten to pay higher. Rights. Two thirds of the agents think it would not prevent them from doing an ebook outside of the contract. Not all non compete clauses are the same. Agents expect the US publishers to collect local market for ebooks. 90% of the agents say they have heard authors are interested in self publishing. Publishers feel they have the edge with by offering an advance. Amazon is only a piece of the market. You have to do more to market to all of the distributors. 25% is going to stick for awhile. This will weaken as print sales weaken. If and when this whole issue will be revisited. Amazon.com speaker Russ Grandinetti the Kindle. Looking to reinvent reading, while emulating the best features of the book. Goal to reach customers around the world. 3.3 times greater purchases in a year of having the Kindle. Greater than 3 to 1 sales of ebooks over actual books. However fast we think this is happening, it’s happening even faster than we can imagine. Print plus digital sales are going up higher than ones that are just digital. 24% of orders are done before street date. Having it up pre-street date is incredibly important. Compelling ideas expressed in their natural length. Making a book free for a month. Sold six or seven times more with the books they did that with. Not suggesting free books are where books should go. Pricing is somewhat controversial. If you think of pricing ebooks compared to traditional books, don’t. Pricing a book in the traditional market can sometimes make someone walk away from a book if it’s too expensive. He wants the book to compete. Nicholas Callaway discussing business model. Also working with authors of the future. On a partnership model. Creating a shared and common strategic goal. Marc Jaffe, speaking on behalf of Trilogy studios, working on a device for reading for kids. They built studios at EA and Fox. Know how to take brands and franchises. Social media capabilities, data tracking with the device. High profile characters and brands. Featured and animated films and secondly with print publishers or agents who control the rights for high profile classics. Revenue sharing, partnerships or royalty based. Launch in second quarter of 2011 with 12 titles. Started as a development house. Full publishing house. Licensing content from children’s books or self help books. End result is a revenue split. They are responsible for 100% of development and marketing and PR. Paying quarterly royalties. 35 children’s books last year. 80 to 125 this year, all on a standard platform. Charlie, all of these companies have emerged so recently and asking what their goals are. Fully content and technology company. (From Nicholas Callaway. They have a financial and strategic partners. Every company is expected to share their technology and innovation within the group they are working with. Currently building a west coast studio along with their east coast studio. Nothing about content can be divorced from technology and also the ability to look ahead and see what’s coming in the next nine months to a year. Learning something new every week. Apps update. Cookie app with Martha Stewart came out in November. New Valentine cookie update came out today. Children’s book publishing present the biggest challenges. A lean forward perspective. Educational and entertainment. That the underlying character has DNA. Team is 6 people. They hire outsourcing for building their apps. Started with Dr. Seuss. Wondering, what would Ted do with an ipad? What is the core goal. Trying to teach a child to read. They aren’t trying to animate right now. Don’t think they’re going that direction but complimenting Callaway. Major updates since the apps have come out. User comments alerted them to make changes. Kids kept hitting buttons and parents mentioned it. They updated the software for auto play based on the feedback. Rick Richter; the apps have to tell great stories. They have to be beautiful but they actual have to be substantial from a story telling perspective. Storyboarding the app so that it makes sense in the context of the story. Have an app know who the audience is. More in line with being an app publisher rather than a developer. General comments about the app store. Callaway : The opportunity in the app world to reach your consumer to know who your consumer is and to continually engage is one of the greatest opportunities this technology provides. Book publishers do not know their end users like the app world publishers do. The greatest revolution of all might be after the app is done paying attention to the end user. Mark Jaffe; Creating product which is recognized or not. First and formost are looking for high profile brands. We love a character which fox has spent 100 million dollars. Well recognized brands and characters. (zzzzzzzzzzzz) Establishing a relationship with the customer. Able to engage, or reengage the customer to be able to sell them something else. Core to their activites. Michel has attacked this market by working with well known markets. Cross promotion between apps. Having a rapour with Apple helps. Building the app gets you half way there. Marketing is the other half. We need a curator as an advocate for kids. The tablet business is expected to grow by 8 times in the next year. Ruckus would like to be that curator. Lets talk about what makes a great app. What constitutes a great experience from the apps? A curator that respects kids. Having the ability to track the user through the app. Going back to them, they have to be careful and can end up damaging the relationship. Has to be a soft sell. I asked what authors and illustrators who are not household names can do in this new climate? Rick Richter said to look at what’s not being done out there. Think high concept. Seasonal. He said, “It’s a lonely market of an ‘only’ app. I’m thinking, the reality is, there’s a gazillion of us who have back lists where we own the rights. There needs to be a way to put our work out there. Maybe it’s creating a collective of established authors who can create clout as a community. The rest of his post can be read on Barney’s blog. The DBW conference is geared towards publishers, but naturally is of interest to authors. It’s been enlightening to follow it via Twitter under these hashtags: #dbw11, #dbw2011, plus session related tags. It’s fun to be a fly on the wall, at least! Today (Wednesday the 26th) is the last day, but you can search on those hashtags to get a sense of what’s been going on. "There are so many reasons why I find ebooks problematic. Barnes & Noble has what’s called Pubit. It’s a self publishing platform. Anybody can upload what they've written and illustrated. website along with standard edited, designed, copyedited PUBLISHED BOOKS! How great is that? For THEM. Here’s where I think things get VERY problematic." Meghan goes onto say that when you browse for classic books, such as Good Night Moon, you'll get self-published books right beside it which are done in an amateurish style, drawn in crayons, or poorly created computer art, etc. In my opinion, I don't think it is a bad thing that all ebooks are offered on the same playing field. And who decides what is "good" and what is "bad". My thought is that if the ebookstores give priority to "real" or "traditional" publishers, then those of us who want to get our OP or original works in ebook formats, will be forced to the back of the bus. Meghan also mentioned the price points being low. I don't think expensive ebooks are necessarily better books. I hope to offer my books in the low price range,(1.99-3.99). SO I say- let the readers/buyers decide. What do you think?...How do feel about your ebook being next to Sally's school book report that her parents turned into an ebook? Should the ebookstores separate published authors and one book wonders? How? I would love to hear what you think. I’m not a good swimmer, I can’t keep up with the technology either--by the time I learn how to navigate one electronic gadget, another takes it’s place. I’m scared by all the changes in publishing, knowing I can never keep up with the latest new thing, but I do feel confident about one old thing: there will always be a need for content. And good work, even if it goes out of print, can have a second life. Technology is obviously making that second life more possible. What about work that seems good, but hasn’t been published? I’ve been debating this right now with a picture book script that had two near misses years ago, the first because the editor said he couldn't visualize the art for the book, the second because the artist selected for the job fell through. If e-book publishing is the next step, the option seems to be for me to illustrate the story myself. Here’s where I am so far: complete sketches and some cut-paper illustrations. And hopefully by the time I finish, little by little, I’ll have gotten a better grasp on that next step. As for all those questions Laura Ruby asked in her post, "It's the end of the world as we know it..." --they are mine too! It's the end of the world as we know it, and I feel...? Nine years ago, I got a phone call early on a Saturday morning. It was from my then-agent, telling me that she'd sold my first novel, LILY'S GHOSTS, a middle-grade mystery. Anyone who knows me can tell you that I don't tear up over much but particularly poignant cat food commercials. But that morning? Yeah. As of today, LILY'S GHOSTS is officially out-of-print. (Maybe it would make more sense to cry over that). But, you know, LILY had a good run. Got great reviews. Sold well. Won some awards and was nominated for others. And LILY has a chance to be reincarnated once I get rich and famous with some other blockbuster book (which will totally happen any minute now, right?) In the meantime, LILY will quietly become, well, a ghost. At least, that’s the way things used to work. Now that we're all flailing around in the face of the e-publishing revolution, nobody seems to be quite sure how things are supposed to work. The headlines, the articles, and the predictions about the future of book publishing are coming fast and furious. On the apocalypse end of the spectrum, there are stories about closing and/or struggling brick and mortar bookstores, like the Mystery Book Store in LA and Borders. Publisher’s Weekly reported that B&N made a bunch of cuts in its buying group. But on the maybe-the-apocalypse-won’t-come-till-I’m-too-old-to-care end of the spectrum, there’s cheerier news for those who believe that a story is a story whether it’s on paper or onscreen. The San Francisco Chronicle reported that Amazon sold 7.1 Kindles last year, and could sell 12 million Kindles next year. Publisher's Weekly reported that Apple sold 7.3 million iPads in the last quarter of 2010. USA Today declared that holiday sales of ebooks outpaced that of print books. 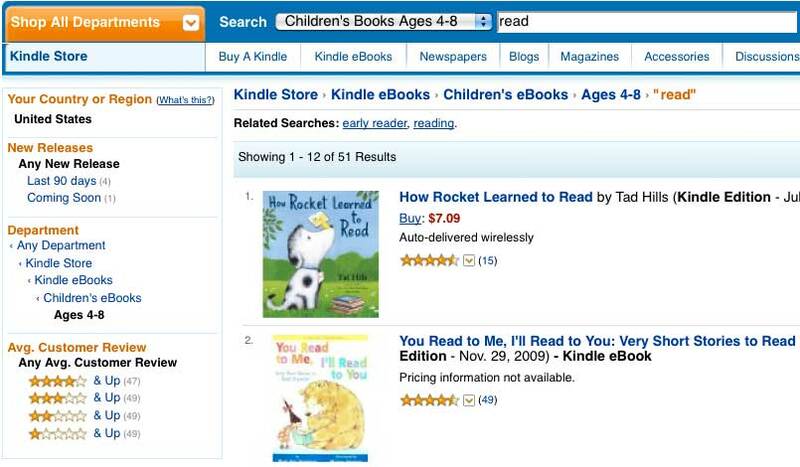 Also, The New York Times reported that it's going to start ranking ebooks in 2011. Publishers are scrambling to try to regroup. The CEO of Thomas Nelson Publishers posted six e-book trends to watch in 2011 including a rising number of ebook clubs and a prediction that publishers might experiment with e-book bundling and "in-book advertising." (Yikes!) Richard Curtis, longtime agent, saw all this coming ten years ago when he started Ereads.com, a publisher that reprints OOP books as ebooks and paperbacks. Despite the efforts on the part of publishers and agents to get a handle on a rapidly changing marketplace, there are authors who are choosing to go it alone. According to thriller writer JA Konrath, who’s now being quoted all over the web, there are many authors selling hundreds or thousands or umpty-jillions of ebooks and making bucket loads of money by self-publishing via the Kindle, Smashwords, Lulu, and other platforms. And he's not alone in his self-publishing evangelism. Cory Doctorow, author of the teen novel Little Brother, has spoken a lot about his own forays into self-publishing. And debates rage at conferences and on blogs whether to abandon traditional publishing entirely. So, what to believe? The publishing biz is dying? The publishing biz is already dead? The publishing biz is alive and kicking and evolving to meet a new digital future full of rainbows and kittens and cash for everyone? Though it feels a little like the Wild West — or the coming plague, depending on your point-of-view — it seems we are living through a pivotal time. And yet, most of what's been written about the e-revolution addresses the changes in adult publishing. A January 3rd Publisher's Weekly article asks, "how accessible will apps and e-books be to kids in the near future, beyond playing with a parent's iPhone or iPad?" And then there are the adults who read kid and teen lit. Gatekeepers like teachers, librarians, and parents, sure, but also people who simply enjoy children's books. (Harry Potter, Twilight, and The Hunger Games, just to name a few crossover titles*). "Children's eBooks represent a largely untapped market for trade publishers," said Dev Ganesan, President and CEO of Aptara, in a press release announcing that the company will be digitizing bestselling backlist titles for Candlewick and Walker. "As children are raised in an increasingly digital world, it won't be long before we see generations more accustomed to eBooks than printed books." For the consumer, all of this is good news. Glorious new apps with amazing levels of interactivity. More choices. Inexpensive books for every age group and for conceivable device. But for the children's book creator, all of this presents a conundrum. If you can get the rights back to your OOP titles, should you dive in and self-publish, or do you wait for success with a newer title, and hope your publisher will see clear to reprint? Should you fight to keep your erights in future deals? What sort of clauses need be in new publishing contracts? Can the picture book hold its own against all those fancy new apps? Is the future of the novel the so-called "enhanced" book, that is, a book with a level of interactivity too difficult for an author or illustrator to pull off on his or her own without the support of a publishing house? When I talk about this stuff to some of my writer and librarian friends, a lot of them sigh and wax poetically about the lovely, comforting smell of printed books. As the proud owner of about two thousand books packing shelves all over my house, I sympathize. The truth is, I like traditional publishing, out-of-print titles and all. Then again, I don't really want LILY'S GHOSTS to become a ghost, not if I can resurrect her myself. Yesterday, I bought a block of ISBN numbers in preparation to reprint LILY as an ebook and a softcover on my own. So, what does the future hold for all of you? Are you pursuing the rights to your OOP books? What your plans for your own backlists? Is this exciting, galvanizing, terrifying, or all three? Is it the end of the world as we know it, or...? PW on the digital revolution in children's publishing. Interesting suggestions for must-have clauses in new contracts. Comments are also interesting. Author Seth Godin goes it alone. Thirty two years ago when the clinic was established, computers were only beginning to be part of the educational scene. The clinic's first computer was an AppleIIe. There were some readers on CD's, mostly by Mercer Mayer and Dr. Seuss, and there were some games. The population that the clinic serves is 60% on the autism spectrum and 40% with other language and learning issues. The computer which was part of the therapeutic setting was a great tool for learning but one of the drawbacks was the mouse. Children with poor motor control sometimes took months to master the use of the mouse. The iPod touch was a great advance because it could be manipulated with just a finger but the small size gave it limited usefulness. The larger iPad screen and the explosion in the availability of apps made it an ideal addition to the therapeutic setting. Even kids that have a lot of physical and cognitive challenges benefit from it. An emphasis on repetition and predictability, language patterns, social interactions, cause and effect, problem solving and communication are just a few of the areas that iPad apps can address. Phyllis would like to see more apps that have untimed games, more games that focus on facial expressions and emotions, and conversational patterns. As of January 21st, Amazon’s former Digital Text Platform has been renamed Kindle Direct Publishing. According to their inaugural newsletter, “Our new name highlights our mission to provide authors and publishers with direct access to publishing to Kindle.” Notices include a contest for unpublished or self-published novels and news that ebooks sold in Canada are now eligible for the 70% royalty that U.S. and UK sales can receive for ebooks priced between $2.99 and $9.99. 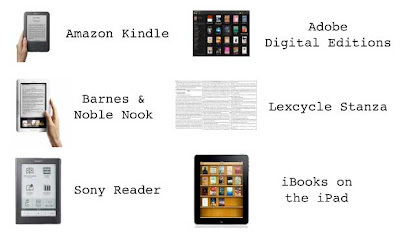 For my article about how to read Kindle-format books without a Kindle device, click here. Many people like the Kindle because its E ink display is easy on the eyes (among other reasons.) But you don’t need one to read Kindle books, just a free reader app for the iPad, iPod, iPhone, PC, Mac, Blackberry, or Android phone. The screenshots below are from the Kindle Reader for the Mac, but the others should be similar, hopefully. Note: click on these images to enlarge if desired. After downloading the app and launching it, it’s time to get something to read. Assuming the device is connected to the Internet, click on the upper right button: Shop in Kindle Store. On the computer, a new window opens in your browser inside the Kindle Store. 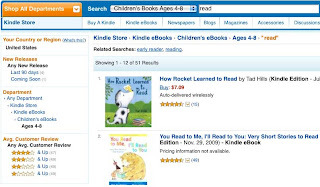 To find children’s books, look on the left under Browse > Kindle eBooks, then click on Children’s eBooks. On the new page, under Browse can be found Baby–3; Ages 4–8; Ages 9–12 and additional options. For this example, I clicked on Ages 4–8. Once on that page, it’s possible to search for something more specific. Above, the word read was entered in the search box to get these titles. Trying different search terms is a great way to see the variety of titles that are available (or not.) Once you find a title, double-click on the jacket to get to the book’s Amazon page. On the right is the option to Try it Free. Click on the Send Sample Now button, and it should download to your Kindle Reader app. Sometimes the sample doesn’t seem to show up at first. In the top menu bar of the Kindle Reader app, try Tools > Sync and Check for New Items. Once the ebook is in your Kindle Reader app, double click on it to open; click the arrow on the side to turn pages. 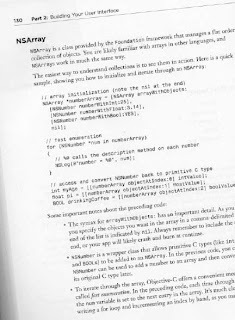 Some ebooks don’t provide much in their sample, some have several pages. To enlarge the text or try out other display options, click on the Aa button (circled below.) To get back to your collection of titles, click on Home (far left button.) To buy the ebook click the Buy Now button which is usually at the end of the sample, or can be found on the jacket icon when its selected. There are quite a few picture books in Kindle format. The Kindle device itself can only show black and white images. As you can see from the above screen shots, if the image files have color, they will be displayed in color on a computer or other color device. Due to the format, images are restricted to square or rectangular spots, not full bleed images as in most traditional picture books. Also, due to the reflow which allows text size to be changed, the images can get separated from the text. Our world of ebooks is so new, there are no clear definitions of what children's book apps and ebooks should look like or include, and that's causing some room for debate. For instance, Kirkus recently started reviewing children's book apps. And while it's wonderful they are including them on their site, some of their comments are raising questions. A prime example is the recent review for my picture book App, Lula's Brew (available for the iPhone and iPad). The review itself was... okay, but one of the negatives mentioned was a lack of interactivity. (Several apps received similar criticism.) And it's true. Other than page turns and the ability to have the story read aloud, Lula's Brew is a pretty straight forward picture book - one of the very first children's book apps ever available, I might add. Picture book creators tend to love this - a straight forward book in digital form. After all, it's what we've been creating all along! 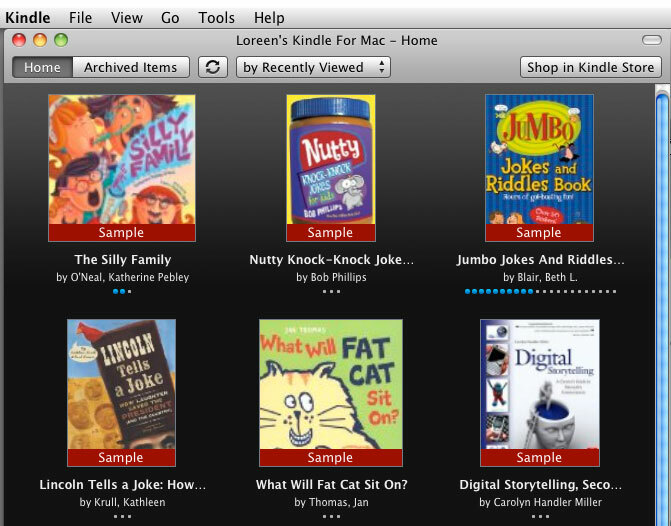 And it's especially promising when you consider iBook 1.2's new ability to present picture books in ePub format. No bells and whistles there - just a simple presentation of a picture book. You flip the pages and can zoom in to see the text. 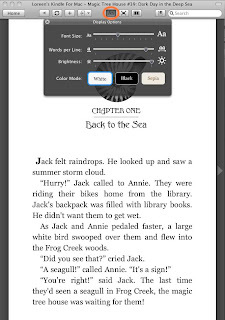 There are currently no read-aloud features, no buttons to push to activate games or animations - it's just a book on a digital reader (an actual eBook). So who says apps and/or eBooks must have buttons to push and animations to trigger simply because they can? Who gets to decide if that is how an app is supposed to work? And why should an app be criticized if it doesn't work that way? Before the reviewers of the world start having too much sway on the subject - let's hear what you, the readers, have to say! Must a picture book app/eBook have interactivity? Is there room for both? Have you ever wondered where ISBNs (that 13-digit number and barcode) come from? An excellent source of information is the International ISBN Agency. Their FAQ page answers questions such as I am not a publisher; can I still obtain an ISBN? (The answer is Yes, by the way.) Links to the many national ISBN agencies are there, and quite a bit more info. If you’re an author who is working on a digital version of an out-of-print or new book, of special interest is a PDF with the title Guidelines for the assignment of ISBNs to e-books. It answers questions such as If I publish in two or more different file formats (e.g. epub, PDF) should I assign separate ISBNs? and How can all the different versions of an e-book be linked together? There is now a page on our blog called Indie Links where useful info about independent publishing of digital books will be found. Pages can be accessed using the green tabs along the top. I write and illustrate books for kids so I know all about ABCs. But RFPs and NDAs? Not so much. Turns out RFP stands for Request for Proposal. And NDA = Non Disclosure Agreement. An RFP basically describes your idea. About 18 months ago I wrote one for my app and I drew out a storyboard with the result of every click, swipe, tilt and shake by the hand of the player. I didn't even know how to describe it. Was it an app? A digital book? A game? 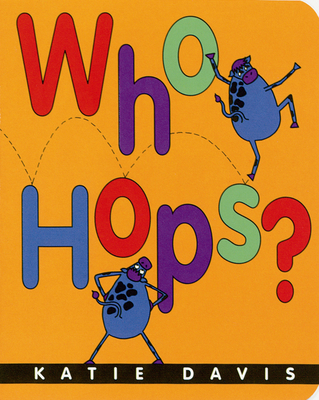 It's actually more of a game based on my book Who Hops? No, it is a game-slash-book. That's what it is. An interactive book? Anyway, after I wrote my RFP, I needed to find someone to turn my design into a gorgeous app type thing that would sell like crazy in iTunes. I started my search to find a developer. I put the word out, I did google searches, and looked at apps I thought were great, and even ones I don't like, but were selling well. I approached people, and if they were interested, sent them my NDA. I didn't show anyone my RFP and storyboard until I had their signed NDA, which legally prevents someone from disclosing what is in an RFP. One young and talented college-aged kid told me he'd do it free. I had a couple of developers tell me they could create the app between $1,000 -$2,000. Another company, which had created an app I think is beyond fabulous, quoted $8000. Another company I love, which is run by a dear friend, gave me a price of $25,000. So I got quotes between free and 25 grand. I wanted to jump at the free offer, but the phrase, "you get what you pay for" kept echoing in my head, and I didn't want to spend all that time, energy and effort on something I wasn't completely happy with in the end. Sometimes I regret that decision. And I couldn't afford the 25k. The company with the $8,000 quote told me that was the lower cost since I wanted to do the art and if I would do the animation myself. I was fine with doing the art, obviously, but I added 'learn animation' to my Stuff I Need To Learn About list (math never makes that to that one somehow). I'd just gotten a big royalty check and decided I'd reinvest it in my company (AKA myself). I handed over half as a deposit and got to work. The animation wasn't horrible, but it wasn't what I wanted and it was taking me so long to do it. And then I started getting ignored by my developer. I suspected they got a bigger client. I emailed, called, texted and sent carrier pigeons and heard nothing. I was getting nervous about my $4,000 deposit but kept assuring myself that I knew where these guys lived (yeah, 3,000 miles away, in Silicon Valley). Finally they told me they had, indeed, snagged a big job and were fine with sending me my deposit back. I was relieved, but exhausted. To spin it positively, I decided to wait until I learned more about what is available to me and how I can make my plan come to life. What actually happened? I got discouraged by the thought of all the tech I'd have to add to my Stuff I Need To Learn About list and I lost steam. I was so relieved about not having spent that huge chunk of money, too, because prices were coming down bigtime. The animation was time consuming for me, and I had other work to do like my books, my podcast, and other projects. After this experience, I was so happy when my friends and colleagues started this coalition and asked me to join in. I'm learning a lot from them, and hope my contributions will teach something, too. Now I'm learning a lot about this process and am happy there are so many companies coming up with ways to create new digital stories to ease the learning curve. I'm happy to have a long Stuff I Need To Learn About list. As long as there is no math on it. There's a lot of confusion between the two. Despite the lump term of this being the "eBook revolution," Apps and eBooks are not the same thing. While eBooks can mean anything from a .pdf to other formats (click here for a comparison of eBook formats on Wikipedia), they often use what is called ePub format. Text flows within a 'frame.' Controls allow the reader to change the font, increase or decrease font size, etc. within that frame. A vignette image, video or sound bite can be embedded in the flowing text, but images cannot run off edge (bleed*) or be locked into a certain layout (because of the ability to resize text). Full illustrations as double page spreads cannot be supported, although single page images can (within the frame) as a single image or screen shot, which is the current move towards placing picture books into the ePub format. However, currently, those page shots are in black and white (on the Kindle, although not always on the iPad). The text is not adjustable. Pages are small and hard to read. So, as of this writing, ePub doesn't truly support picture books. Apps are a completely different animal. Apps are like mini-programs, which basically means, the sky is the limit. That's where all the interactivity can come in, with touch screen controls, sound, full bleed images, etc. Picture book apps have been called eBooks, interactive storybook apps, story apps, or children's book apps. But whatever the term used, they're awesome. So why aren't all books apps? Because currently, most eReaders run primarily via ePub. And it makes sense when you compare the size of what is basically a text document to the size of an interactive app. The iPhone/iTouch/iPad put apps on the map. However, even within apple, the iBookstore only represents eBooks - not apps (which is another can of worms I'll talk about later). 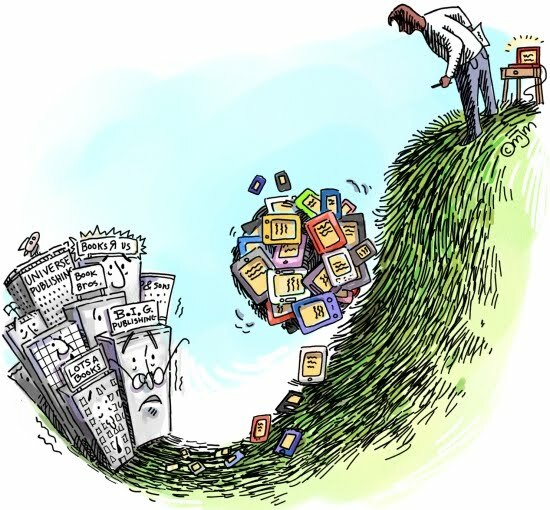 That may not seem fair, but technology is changing rapidly and the two technologies are slowly meeting in the middle. They're not there yet, but give it a little time. And I do mean a 'little' - the eBook revolution is moving fast! Need an example? 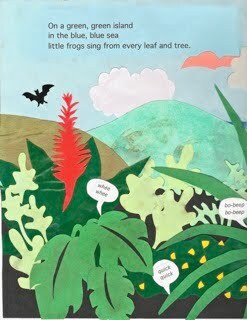 My picture book, Lula's Brew, is an app available on the iPhone/iTouch/iPad (check the version), but it is not an eBook. *Note: As of December 15th, iBooks 1.2 now allows full bleed, double page spread images with zoom - a true picture book experience online. Not many exist yet, and it's not on the Kindle, but if you search for "Tron: the Movie Storybook" in iPad's iBooks, you can download a free sample. Wow. This changes everything. We are a group of published children’s authors and illustrators who are interested in or are already creating digital books for kids. The premise of our name is that a book is a book regardless of the format. With the option of interactivity within some formats, new creative possibilities are open to us. Our already-published books range from pre-school to Young Adult, so there should be something for almost everyone. What is an ebook and what do we want it to be? How are people using ebooks “in the wild”? Personally, I’m intrigued about bringing my out-of-print titles back into digital form, such as my picture book about theater, The Bunny Play. My current theory is to totally rethink it, cut and paste portions of the art into new illustrations, maybe turn it into a chapter book...who knows! And, I’ve been scribbling concepts for various other new digital books into a notebook. The dilemma is which one to work on first? This promises to be an exciting journey, so please join us and we can figure it out together!